A new study shows that the Antarctic Ice Shelf has been thickening – in times of global warming. Logic: Global warming cannot be the driving factor for Antarctic ice shelf mass, let alone CO2. Antarctic ice shelf. NASA photo (Chris Larsen) – public domain. Whenever a chunk of ice breaks off the Antarctic ice shelf, the guilty party is immediately found by the media: man. He did it with his SUVs, his planes and his container ships. But what makes everything all the more surprising is a recent press release from Scripps Institution of Oceanography from 8 January 2018. Weather phenomenon El Niño is causing the ice shelf in the Amundsen Sea to melt from underneath. Oscillations of water temperature in the tropical Pacific Ocean can induce rapid melting of Antarctic ice shelves. A new study published Jan. 8 in the journal Nature Geoscience [Paolo et al. 2018] reveals that strong El Niño events can cause significant ice loss in some Antarctic ice shelves while the opposite may occur during strong La Niña events. El Niño and La Niña are two distinct phases of the El Niño/Southern Oscillation (ENSO), a naturally occurring phenomenon characterized by how water temperatures in the tropical Pacific periodically oscillate between warmer than average during El Niños and cooler during La Niñas. The research, funded by NASA and the NASA Earth and Space Science Fellowship, provides new insights into how Antarctic ice shelves respond to variability in global ocean and atmospheric conditions. The study was led by Fernando Paolo while a PhD graduate student and postdoc at Scripps Institution of Oceanography at the University of California San Diego. Paolo is now a postdoctoral scholar at NASA’s Jet Propulsion Laboratory. Paolo and his colleagues, including Scripps glaciologist Helen Fricker, discovered that a strong El Niño event causes ice shelves in the Amundsen Sea sector of West Antarctica to gain mass at the surface and melt from below at the same time, losing up to five times more ice from basal melting than they gain from increased snowfall. The study used satellite observations of the height of the ice shelves from 1994 to 2017. After further analysis of the data, the scientists found that although a strong El Niño changes wind patterns in West Antarctica in a way that promotes flow of warm ocean waters towards the ice shelves to increase melting from below, it also increases snowfall particularly along the Amundsen Sea sector. The team then needed to determine the contribution of the two effects. Is the atmosphere adding more mass than the ocean is taking away or is it the other way around? ‘We found out that the ocean ends up winning in terms of mass. Changes in mass, rather than height, control how the ice shelves and associated glaciers flow into the ocean,’ Paolo said. While mass loss by basal melting exceeds mass gain from snowfall during strong El Niño events, the opposite appears to be true during La Niña events. Over the entire 23-year observation period, the ice shelves in the Amundsen Sea sector of Antarctica had their height reduced by 20 centimeters (8 inches) a year, for a total of 5 meters (16 feet), mostly due to ocean melting. The intense 1997-98 El Niño increased the height of these ice shelves by more than 25 centimeters (10 inches). However, the much lighter snow contains far less water than solid ice does. When the researchers took density of snow into account, they found that ice shelves lost about five times more ice by submarine melting than they gained from new surface snowpack. ‘Many people look at this ice-shelf data and will fit a straight line to the data, but we’re looking at all the wiggles that go into that linear fit, and trying to understand the processes causing them,’ said Fricker, who was Paolo’s PhD adviser at the time the study was conceived. ‘These longer satellite records are allowing us to study processes that are driving changes in the ice shelves, improving our understanding on how the grounded ice will change,’ Fricker said. Meanwhile the Potsdam Institute (PIK) continues to work from the alarmism playbook. Read the entire article at National Geographic. Have you looked in on the status of the Great Climate Bet lately? I think the last update was a few years ago. Way back when you guys made the bet, Rob Honeycutt claimed that by “around 2017” (or something like that … too lazy to look up the exact quote) it would be obvious that the warmists were winning. They are winning – thanks to the large El Nino from 2015-16. Right now it would take a large La Nina (not on radar) or large VEI volcano eruption to get back in the game. A pre-emptive DNFFT is in order here. Thanks for the quick reply. But there are still several more years in the bet, and as the El Nino recedes into the past, perhaps this will change? We have had over a year of neutral to La Nina conditions, and it seems likely to continue that way for the foreseeable future. And solar activity is very low. The combination of the two should keep temperatures down, so perhaps the bet is not lost yet. I think Niels Bohr was paraphrasing a Danish proverb with ‘predictions are difficult particularly about the future’ but I think there is only one sure bet viz. that despite every wealth-destroying international agreement the atmospheric CO2 concentration will be about double the pre-industrial level by the end of this century and all one can say is that whatever the then GAT it will be about 1C warmer than it would have otherwise been. Not Niels Bohr, but Yogi Berra. And surprise, ice thickens when it gets colder around the ice. Global warming doesn’t mean that every place everywhere gets warmer all the time. I hope you aren’t “celebrating” the winter increase in the Arctic as “evidence” that global warming can’t be the driving factor of the ice extent/mass decreasing there. That would be similar “logic”. Where is the logic…? 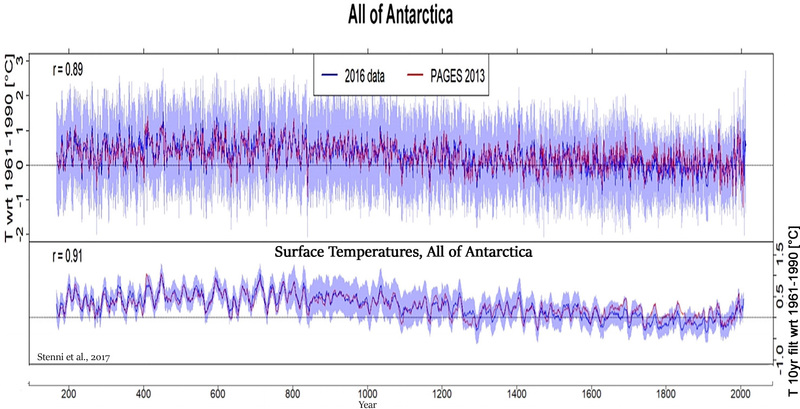 As the GRACE data clearly shows, the ice mass in Antartica is decreasing. (1) According to peer-reviewed science, the total Antarctic continent has been gaining mass and removing water from sea levels since 1800, with the net reduction in sea level contribution from mass gains accelerating after 1900. Our results show that SMB [surface mass balance] for the total Antarctic Ice Sheet (including ice shelves) has increased at a rate of 7 ± 0.13 Gt decade−1 since 1800 AD representing a net reduction in sea level of ∼ 0.02 mm decade−1 since 1800 and ∼ 0.04 mm decade−1 since 1900 AD. The largest contribution is from the Antarctic Peninsula (∼ 75 %) where the annual average SMB during the most recent decade (2001–2010) is 123 ± 44 Gt yr−1 higher than the annual average during the first decade of the 19th century. (2) West Antarctica has been rapidly cooling at a rate of -0.47°C per decade since 1999. However, a recent analysis (Turner et al., 2016) has shown that the regionally stacked temperature record for the last three decades has shifted from a warming trend of 0.32 °C/decade during 1979–1997 to a cooling trend of − 0.47 °C/decade during 1999–2014. … This recent cooling has already impacted the cryosphere in the northern AP [Antarctic Peninsula], including slow-down of glacier recession, a shift to surface mass gains of the peripheral glacier and layer of permafrost in northern AP islands. (3) West Antarctica is much cooler now than it was during both the Little Ice Age, Medieval Warm Period, and 1st Millennium, when CO2 levels were in the 275 ppm range. (4) East Antarctica has been “ubiquitously” cooling since 1979. Over the past 60 years, the climate of East Antarctica cooled while portions of West Antarctica were among the most rapidly warming regions on the planet. The East Antarctic cooling is attributed to a positive trend in the Southern Annular Mode (SAM) and a strengthening of the westerlies, while West Antarctic warming is tied to zonally asymmetric circulation changes forced by the tropics. This study finds recent (post-1979) surface cooling of East Antarctica during austral autumn to also be tied to tropical forcing, namely, an increase in La Niña events. … The South Atlantic anticyclone is associated with cold air advection, weakened northerlies, and increased sea ice concentrations across the western East Antarctic coast, which has increased the rate of cooling at Novolazarevskaya and Syowa stations after 1979. This enhanced cooling over western East Antarctica is tied more broadly to a zonally asymmetric temperature trend pattern across East Antarctica during autumn that is consistent with a tropically forced Rossby wave rather than a SAM pattern; the positive SAM pattern is associated with ubiquitous cooling across East Antarctica. (5) East Antarctica (comprising 75% of the continent) has also been gaining mass since at least 2003. We investigate the mass balance of East Antarctica for 2003–2013 using a Bayesian statistical framework. … We apportion mass trends to SMB and ice dynamics for the EAIS, based on two different assumptions, different remote sensing data and two RCMs. In the first experiment, the model apportions about a third of the mass trend to ice dynamics, +17 Gt/yr, and two thirds, +40 Gt yr−1 to SMB, resulting in a total mass trend for the EAIS [East Antarctic Ice Sheet] of +57 ± 20 Gt yr−1. (6) There has been no continental-scale warming of Antarctica in the last 100 years. 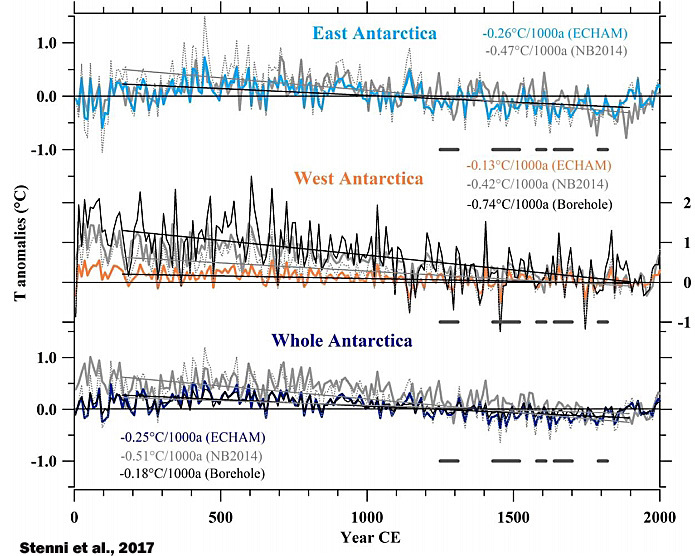 Our new continental scale reconstructions, based on the extended database, corroborates previously published findings for Antarctica from the PAGES2k Consortium (2013): (1) Temperatures over the Antarctic continent show an overall cooling trend during the period from 0 to 1900CE, which appears strongest in West Antarctica, and (2) no continent-scale warming of Antarctic temperature is evident in the last century. 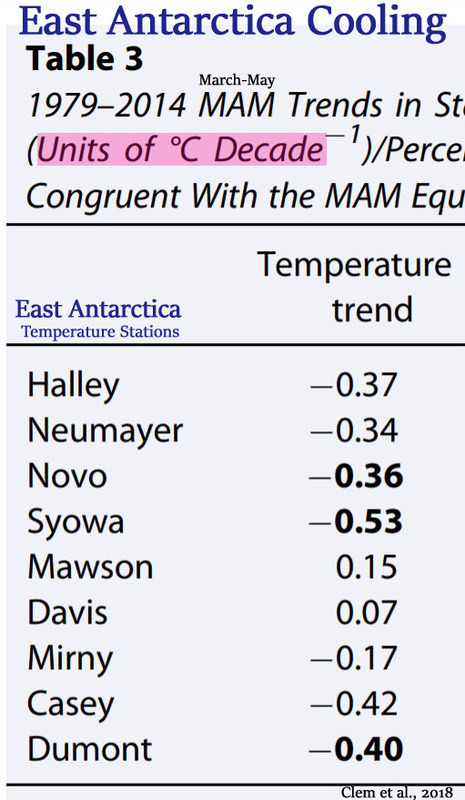 Given these data in references 1-6 from the scientific literature (more is available like this, if needed), please explain the logic with regard to a clear connection between anthropogenic CO2 emissions and the Antarctic climate and/or ice sheet mass balance. Kenneth. Don’t try and confuse our resident troll with facts. Facts like coming up with SMB gains against a total ice mass loss statistic? The confused one is Kenneth here 😉 I wonder at what point in the future he will realize that looking at SMB only is missing half of the equation (in Antarctica as well as in Greenland). Facts like coming up with SMB gains against a total ice mass loss statistic? I presume you are referring to the Thomas et al. (2017) paper. You’ve previously shown that you don’t understand what melt water equivalent means, or how sea levels change in response to mass gains vs. mass losses. I’ll attempt to educate you again, SebastianH. Perhaps with more repetitions you’ll understand how this works. Apparently you believe a net reduction in sea level from the net change in SMB means that there was an overall decrease/loss of ice. That’s not how it works, of course. An ice sheet that loses mass does not reduce sea water equivalent or remove water from sea levels. Mass losses add to or raise sea levels. If you don’t agree, please provide an example from the scientific literature where sea level reductions were concomitant with ice sheet mass losses. Dr. Zwally and colleagues (2015) concluded that the gains in East Antarctica exceeded the losses in West Antarctica, leading to net surface mass gain for the 1992-2008 period. Again, a mass gain means that water has been removed from sea levels — not added to them. It’s only when mass losses occur that ice sheets and glaciers positively contribute to (add to) sea levels. See how taking -0.23 mm/yr away from sea levels is associated with net mass gains? Has this cleared it up for you or are you still unsure how sea level reductions from ice sheet mass gains work? I presume you are referring to the Thomas et al. (2017) paper. I’ll attempt to educate you again, SebastianH. Please don’t. You actually made it worse. Repeat after me: the SMB doesn’t include ice discharge/melt. It IS mentioned in that paper, yet you somehow imagine that the total ice mass of Antartica is increasing. Why? Because you can’t read and interpret papers correctly. That Zwally paper is a bit weird, because it contradicts the GRACE measurements (see link above or https://www.nature.com/articles/ngeo694). I’ll take gravity based mass changes over estimating mass from height measurements any time (considering the huge amount of papers about the mass loss measured by GRACE). Get off your high horse and learn something about SMB and ice mass gains/losses. Maybe it would clear things up for you quite a bit. Nope, you still don’t understand that a removal of water from sea level rise due to ice sheet changes means that there was a net mass gain. Oh well. I tried to educate you. A graph of Antarctic ice mass since 1900. Since you still apparently believe that a reduction in sea levels is not equivalent to a mass gain in the ice sheet per the m.w.e value, but instead a mass loss, here are a few more papers that clearly connect mass gains to sea level reductions. I have yet to find a paper (perhaps you can provide a link to one?) that shows what you believe to be true: sea level reductions occur due to ice sheet/glacier net mass losses. Satellite radar altimetry measurements indicate that the East Antarctic ice-sheet interior north of 81.6°S increased in mass by 45 ± 7 billion metric tons per year from 1992 to 2003. Comparisons with contemporaneous meteorological model snowfall estimates suggest that the gain in mass was associated with increased precipitation. A gain of this magnitude is enough to slow sea-level rise by 0.12 ± 0.02 millimeters per year. The change of ice thickness and velocity in the ice shelf [East Antarctica] is mainly influenced by the basal melt distribution, but, although the ice shelf thins in most of the simulations, there is little grounding line retreat. … Overall, the increased accumulation computed by the atmosphere models outweighs ice stream acceleration so that the net contribution to sea level rise is negative. While several studies [e.g.,Rignot et al., 2008; Velicogna, 2009] indicate no significant changes in the East Antarctic ice sheet between 2002 and 2009, GRACE recently observes mass gain along the coast (Figure S1). A spatial average over the region where this mass gain is observed (30 W–60 E, 65 S–80 S) shows a relatively stable mass budget from 2003–2008, followed by a strong increase that began in 2009 (Figure 2). The cumulative mass gain observed by GRACE between early 2009 and 2011 is approximately 350 Gt, which is equivalent to about -0.32 mm/yr global sea level decrease. just continues to go backwards…. like it has since you failed junior high. First: a comment of mine was deleted here or never showed up. Second: don’t make it worse Kenneth. Why are you trying to dress up your straw man? That is correct. But you obviously think that a calculated reduction of sea levels from SMB gains is equivalent to a net sea level reduction when taking ice loss/melt into account. And have you even looked at the papers you quoted from in the last reply here? Read the last one. 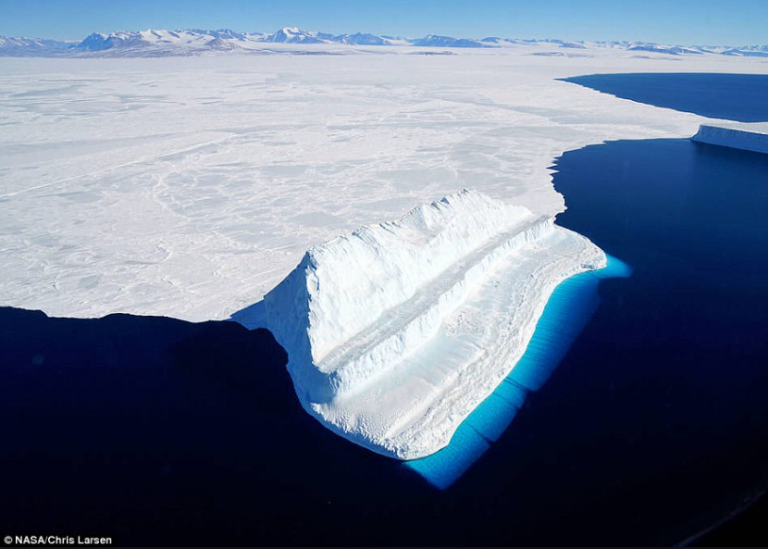 It describes an increase in mass on ONE part of Antartica which equals a decrease in sea level. So what? 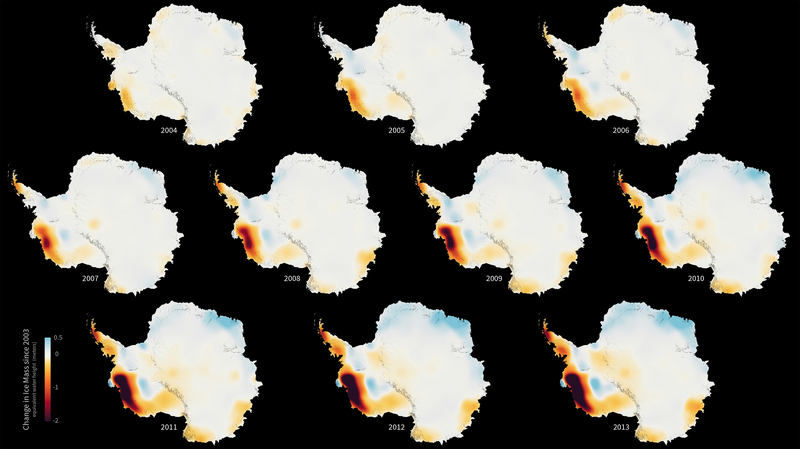 The overall mass of Antartica ice decreased in that period of time, increasing the sea level. The mass loss from the entire ice sheet between 2009 and 2011 amounts to about 325 Gt (not shown) or 0.3 mm/yr equivalent sea level. Hence, despite the regional mass gain the total amount of mass loss remained comparable to the rate between 2003 and 2009. What else do you need to realize where you are wrong? the SMB doesn’t include ice discharge/melt. This still appears to be beyond your grasp. The melt water contribution to sea level rise — whether it’s a reduction in sea levels or an addition to sea levels — IS INCLUDED in the mass gain vs. mass loss value (in Gt) for the ice sheet. You’re the one getting hung up on SMB. I’m talking about overall mass gains vs. overall mass loss for the ice sheet or glacier…as represented by the contribution to sea level change. And, again, you still apparently believe — without any scientific backing — that a net change in ice sheet mass that leads to a reduction in sea level means that there was a net loss in mass rather than a net gain. That’s why you keep on insisting the AIS lost mass despite the -0.02 mm/yr to -0.04 mm/yr reduction in sea levels over the 1800-2010 period. From 1800 to 2010, the net contribution to sea level rise was negative for the Antarctic ice sheet: “a net reduction in sea level of ∼ 0.02 mm decade−1 since 1800 and ∼ 0.04 mm decade−1 since 1900 AD.” This means that the Antarctic ice sheet did not lose mass, but gained mass over this period. If there was a net addition to sea levels rather than a net removal from sea levels, this would mean that there was an ice sheet net loss over this period. Still not clear? I’ll provide some more examples. The Greenland ice sheet is thinning at the margins (–42 ± 2 Gt/yr–1 below the equilibrium-line altitude (ELA)) and growing inland (+53 ± 2 Gt/yr–1 above the ELA) with a small overall mass gain (+11 ± 3 Gt/yr–1; –0.03 mm/yr SLE (sea-level equivalent)). Still not clear? How many more times and in how many more ways will it need to be explained to you that a net reduction in sea levels is due to a mass gain in an ice sheet/glacier? By the way, the original purpose of providing the science that shows cooling in West Antarctica, East Antarctica, mass gains, sea level reductions resulting from those mass gains, and no continental-scale temperature increase in the last 100 years was to establish that there is no anthropogenic signal detectable in the changes in the Antarctic ice sheet. Do you agree or disagree with that? There has been no net warming in the Antarctic since serious recording began in 1957. If there is any actual ice loss from Antarctica, rather than measures of volcanic gravity anomalies, then it sure has NOTHING to do with atmospheric temperature. then it sure has NOTHING to do with atmospheric temperature. It is consistent with where Antarctica is warming. So, NOTHING to do with CO2. All to do with a NATURAL SOLAR WARMING. Thanks, but we all KNEW that. You know there is absolutely ZERO proof that CO2 causes any ocean warming, no matter how much you yap your mindless mantra. …. and CO2 DOES NOT warm the oceans, the SUN does. If you have ANY EMPIRICAL EVIDENCE of CO2 warming the ocean or the atmosphere..
or remain your usual mindless yapping vassal. OOPS !!! AGW propaganda GOOFED AGAIN. ! OOPS…. AGW propaganda GOOFS AGAIN !! Oh boy, now he is happy again because he thinks I have shown something … your reality distortion field is pretty strong. Don’t know why I keep replying to your nonsense. Of course you have to say the CO2 effect over Antarctica is negative. Antarctica has been cooling.. doesn’t fit the anti-CO2 myth. …. just so long as you don’t have to actually PRODUCE ANY EVIDENCE, hey seb. I don’t “have to say” this. Whenever the atmosphere is warmer than the surface the greenhouse effect is negative. That is a consequence of the physics involved. Whenever the atmosphere is warmer than the surface the greenhouse effect is negative. And even if it isn’t negative, the greenhouse effect’s influence on polar climates is quite “weak” (from less than zero W m-2 up to only 1 W m-2) according to the very paper you just provided a link to (that you oddly think helps you). Even if CO2 concentration is quadrupled, the associated forcing is a paltry 1 W m-2. 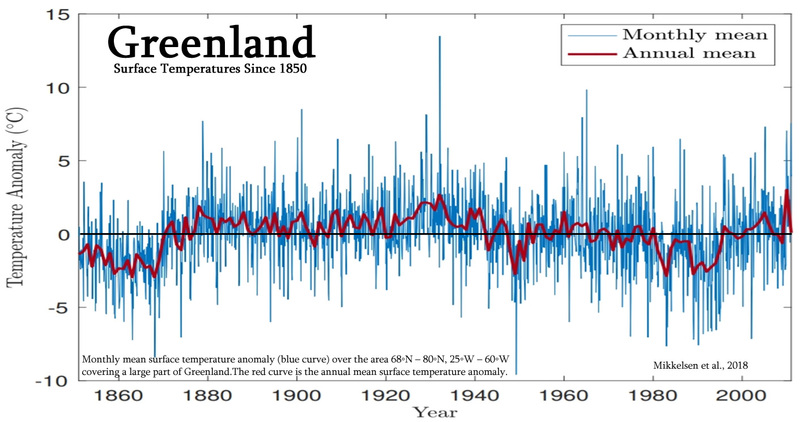 CO2 also provides a “comparatively weak” forced influence on the Arctic climate (Greenland). In fact, the paper’s authors say that the Arctic climate (Greenland, E. Siberia) has the lowest warming influence from CO2 in the entire Northern Hemisphere. This would not appear to strengthen the position that the Arctic climate (including sea ice changes and ice mass changes) is predominantly influenced by CO2 concentration changes. So can you explain why you think it is that a paper that effectively affirms a negligible forcing influence for CO2 concentrations for both polar climates is supportive of your claims that ice sheet melt and sea ice losses and warming temperatures are largely controlled by CO2? Because this paper obviously contradicts these claims. So now energy DOESN’T flow from warmer to cooler. The warmer atmosphere makes the surface colder. Amazing, topsy-turvy, seb FANTASY FIZZICS !! So can you explain why you think it is that a paper that effectively affirms a negligible forcing influence for CO2 concentrations for both polar climates is supportive of your claims that ice sheet melt and sea ice losses and warming temperatures are largely controlled by CO2? Of course the greenhouse effect is smaller where less Sun warms the surface. The poler regions aren’t warming because of a direct increase of the GHE in those regions, they are warming because Earth’s weather system transports heat from the tropics towards the poles. Do you honestly think that climate science says that it is direct CO2 forcing that is warming every m² of the surface of the planet? Do you honestly think that because the GHE is weak in poler regions it doesn’t affect those region indirectly? Is your misunderstanding of climate science that big? Because this paper obviously contradicts these claims. Apparently it is, since this seems to be your understanding. The poler regions aren’t warming because of a direct increase of the GHE in those regions, they are warming because Earth’s weather system transports heat from the tropics towards the poles. But the polar regions aren’t warming. There has been no net warming in Antarctica for the last 100 years. West Antarctica has been rapidly cooling since 1999. An anthropogenic impact on a change in the SMB of the Antarctic ice sheet has not even been detectable for recent decades. There has been no net warming trend in the Arctic for the last 80 years, with cooling occurring between the 1940s and 1980s. 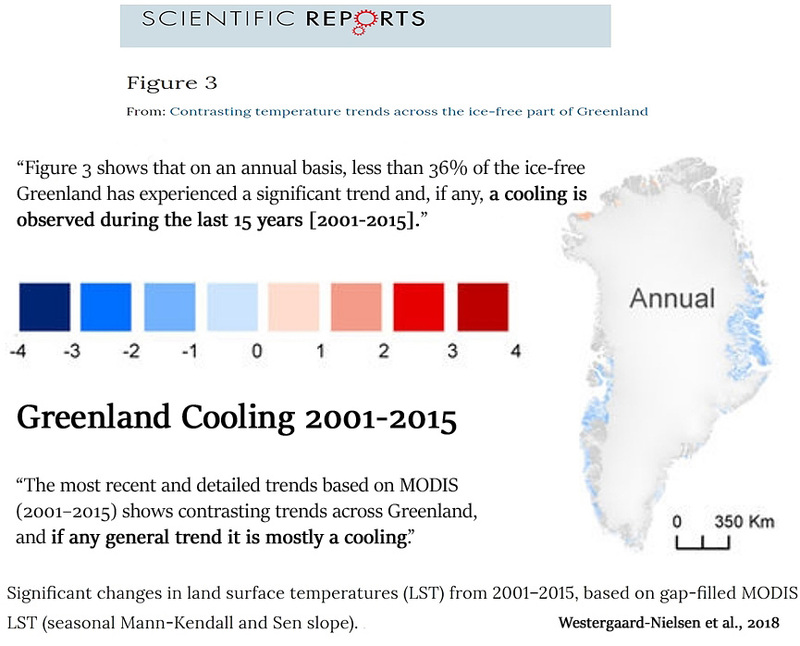 Greenland has experienced no net warming in the last 80 years, with a net cooling trend since 2001. So where, exactly, is the anthropogenic signal in the polar regions, SebastianH? The CO2 forcing signal is already quite “weak” — around 0 to 1 W m-2 — for the polar regions according to the paper you referenced. Compare that to clouds, for example, which scientists have maintained drive the ice sheet melt since 1995 for Greenland, amounting to a -27 Gt loss per percent reduction in cloud cover. CO2 can’t even come close to competing with that with its “weak” forcing values for the polar regions…and yet you’re still a believer that CO2 is what controls melting ice sheets and sea ice? The lengths you must go to to maintain those beliefs of yours is astonishing. they are warming because Earth’s weather system transports heat from the tropics towards the poles. 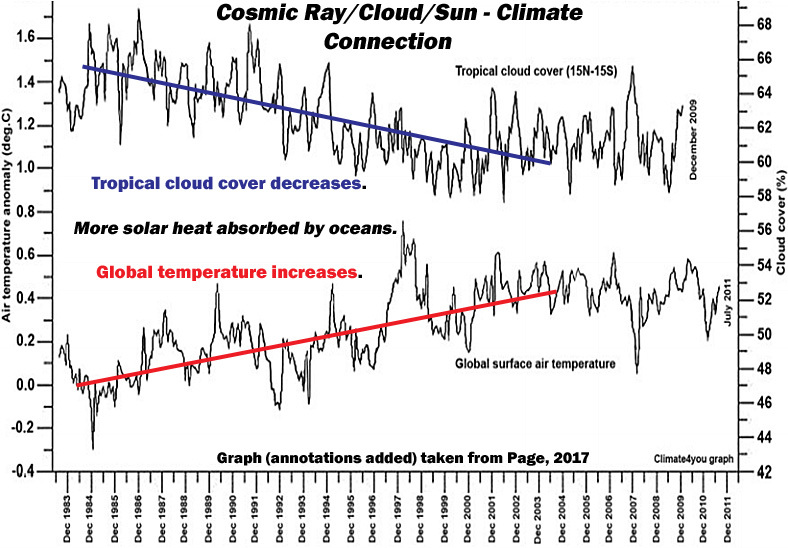 Cloud cover changes in the tropics are significantly what determines how much solar heat is absorbed by the oceans. Less clouds, more solar heating. More clouds, less solar heating. Do you agree or disagree? You KNOW there is no evidence that CO2 actually warms oceans, atmosphere or ANYTHING. The tropical oceans DO NOT warm from atmospheric CO2, there is absolutely ZERO EVIDENCE to support your mindless suppository. If you say so. Then the decreasing ice mass in the last decades is probably fake, right? Are you sure? One of the papers you quoted from mentioned “increased snowfall is to be expected with global warming” and – surprise – found increased snowfall. Sure, as do GHGs. The important thing here is probably “more heat” that can be transported around the globe. P.S. : Any chance to find an updated version of your graph that doesn’t end in 2009? The Antarctic is a PROVEN highly active volcanic regions. I know your understanding physic, science, geology, and EVERYTHING, bears no relation to any sort of reality. But do try to WAKE UP to when you are being fed rampant propaganda. !! … because the fact is that Arctic sea ice is STILL in the top 90-95% of its extent of the last 10,000 years, showing that we really are still very much at a COOLER period of the current interglacial. There is NO “GLOBAL” WARMING. There is regional warming due to ocean dispersal of Solar energy. Those places unaffected by these releases of SOLAR energy from the oceans, ARE NOT WARMING. The ONLY warming in the satellite era has been from these releases of stored SOLAR energy from the oceans during El Nino event. Between those events… ZERO WARMING. There is ABSOLUTELY NO EVIDENCE that human CO2, or anything other than small areas of urban warming, has ANY AFFECT on the calculated global temperature. If you say you have such evidence THEN PRODUCE IT !! Ok, so no conclusion, instead some insulting remarks. Anyway, can you be bothered to find out the output (in mW per m²) of this volcanic activity? Notice: this is performing constant work … the amount of Joules is different after 1h vs. 2h. So it causes warming above the normal equilibrium state. Some day you’ll understand. And a few hundred million years back there was no ice on Antartica … so still no problem today, right? There is regional warming due to ocean dispersal of Solar energy. That is correct, more or less. How can an El Nino possible cause a lasting warming of the global average temperature? Please explain that mechanism. An El Nino causes the ocean heat content to decrease and causes a temperature increase of the atmosphere as a result. How does the atmosphere stay warmer after the event? Of course there is. CO2 concentration increase is changing the radiative balance. It has been measured, it is what one would expect from the physics of radiative gases. Search Google scholar, read papers, listen to actual climate scientists. Stop listening to those lunatic skeptics that for whatever reason don’t want CO2 to cause anything. So now you agree that there is no “global” warming? A few weeks ago you wrote that it is “simply not true” to say that. So now you agree that there is no “global” warming? It is called global warming because on average the entire globe is warming, the heat content increases. Obviously not everywhere by the same amount. And ultimately it’s the Sun’s energy that gets distributed that is the cause for warming/cooling on the regional level. The increasing amount of GHGs keeps more of this energy in the system (the mentioned heat content increase). A few weeks ago you wrote that it is “simply not true” to say that. I really don’t get why you sometimes demand taking every word said into account and do this kind of thing in return. Why? He wrote “large parts” and that simply isn’t true. Look at any anomaly map of this planet. When asked to PRODUCE REAL EVIDENCE..
… the poor little sludge-for-brains AGW stall-wart falls flat on his face.. So predictable.. SO EMPTY … so seb. Do you feel like you have produced anything yet that could count as evidence of whatever it is that you are claiming is true? Your squirming and headless chook routine continues, little seb,..
You ignorant little twerp !! El Nino is a surge of warm water, from SOLAR ENERGY, , to the surface in the Tropics, that releases some energy to the atmosphere, but also distributes the warmer water around the world via surface ocean currents. Do you DENY that there was a STEP-CHANGE in atmospheric temperature at the 1998 EL Nino..
Do you disregard REAL DATA that much? Why do we ALWAYS have to try to teach you the basics of everything ? Did you totally avoid getting an education in junior high ??? Certainly seems like it from your continually IGNORANT comments. The really bizarre thing is that you seem to be doing everything in your power to remain WILFULLY IGNORANT. ! Can only reply with 80% insults between nonsense … do you think your way of arguing is a good strategy? Also, what is the mechanism that enables the surface temperatures to stay higher after an El Nino than before the event? How does that work? Is it similar to turning on the heater for 1 hour and expecting the temperature not to decrease back to the level from before we turned the heater on? Is that how it works in your fantasy world? ZERO-SCIENCE.. and another mindless anti-thought analogy. Sorry you are INCAPABLE of understanding the basic mechanisms of ocean heat transfer. Sorry that you are absolute ignorant of anything to do with physics and science..
Do you STILL DENY that there was a DISTINCT step change around the 1998 El Nino, despite being VERY OBVIOUS in the satellite data? Climate Data DENIAL seems to be your thing, seb. You just continue with your EMPTY MINDLESS and very juvenile attempts at DISTRACTION. Always nice to see real science being conducted. Field work to actually go see what is going on instead sitting around on a computer creating modeled fantasies. Antarctic sea ice looks to have bottomed out and is current about 400,000km² above last years El Nino affected low. Very close to 2006 and 2012 for the same day. It will be interesting to see how quickly it grows now that most of the El Nino effects have faded. I keep waiting for Sebastian to show that CO2 did it in the thread, but he manage not to that. He also failed to grasp the obvious WHY GRACE measurements in the region are unreliable, as Andy explained why. Because of volcanoes … right. Obviously, the scientists going over the data haven’t thought of that and are completely missing the volcano in the region with one of the highest density of volcanoes on this planet. Because of volcanoes … right. 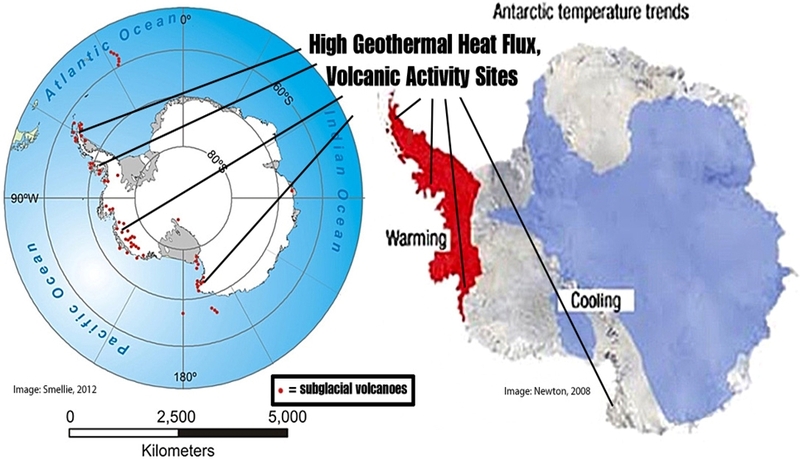 Yeah, it’s just a coincidence that the places where it is/was warming in Antarctica happen to be the same places with high geothermal heat flux, and the places where it is/has been cooling are the same places where there is effectively no geothermal heat flux. Mantle plumes may more than double the geothermal heat flux above nominal continental values. … The experiments show that mantle plumes have an important local impact on the ice sheet, with basal melting rates reaching several centimeters per year directly above the hotspot. Antarctica is the largest reservoir of ice on Earth. Understanding its ice sheet dynamics is crucial to unraveling past global climate change and making robust climatic and sea level predictions. Of the basic parameters that shape and control ice flow, the most poorly known is geothermal heat flux. Direct observations of heat flux are difficult to obtain in Antarctica, and until now continent-wide heat flux maps have only been derived from low-resolution satellite magnetic and seismological data. We present a high resolution heat flux map and associated uncertainty derived from spectral analysis of the most advanced continental compilation of airborne magnetic data. Small-scale spatial variability and features consistent with known geology are better reproduced than in previous models, between 36% and 50%. Our high-resolution heat-flux map and its uncertainty distribution provide an important new boundary condition to be used in studies on future subglacial hydrology, ice-sheet dynamics and sea-level change. …in light of concerns over whether enhanced geothermal heat fluxes and subglacial melting may contribute to instability of the West Antarctic Ice Sheet. … The overall result presented here constitutes a first inventory of West Antarctica’s subglacial volcanism. We identified 138 volcanoes, 91 of which have not previously been identified, and which are widely distributed throughout the deep basins of West Antarctica, but are especially concentrated and orientated along the >3000 km central axis of the West Antarctic Rift System. … [V]olcanism affects geothermal heat flow and, hence, basal melting, potentially also impacting upon ice dynamics. West Antarctica’s vast ice sheet conceals what may be the largest volcanic region on earth, research has revealed. … Previous studies and the concentration of volcanoes found in the region together suggest that activity may have occurred in previous warmer periods. The first physical evidence of subglacial volcanism under the West Antarctic Ice Sheet … New evidence from ice core tephra shows that subglacial volcanism can breach the surface of the ice sheet and may pose a great threat to WAIS stability. … The sources of these tephra layers were likely to be nearby subglacial volcanoes, Mt. Resnik, Mt. Thiel, and/or Mt. Casertz. A widespread increase in ice loss from WAIS could trigger positive feedback by decreasing ice mass and increasing decompression melting under the WAIS, increasing volcanism. The movement of magma under the ice would TOTALLY mask the gravity measurement of any slight gain or loss surface ice. You don’t have the intelligence to figure that out, do you seb. And as already shown, any losses that MIGHT have occurred, have been from below, so ABSOLUTELY NOTHING to do with atmospheric CO2 or any other human cause. Now what could possibly warm the water below just one part of the Antarctic,…. that just “happens” to be over the most active volcanic region. Must be a trace change of non-warming atmospheric CO2, right, seb. !! …but you are now being more ridiculously idiotic and anti-science than usual… and that is a big stretch !! Let’s just show that Total Antarctic Ice Mass graph again, in a pointless attempt to educate the wilfully dumb seb-trollette.